4.22 p.m. R8 14 Sound Works (5 m Not a Single Doubt – Abu Zayan, by Mark of Esteem) – Shaun McKay; tried hard but found Heavy11 conditions too testing in the Rating 75 1400 metres on 12 May at Rotorua, after contesting the Flying Handicap (Listed, 1400m) on 31 March at Awapuni. 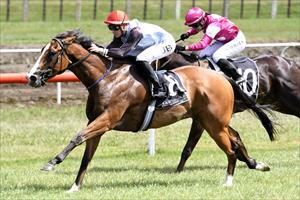 She could be ideally drawn (11), off the rail, in the $25,000 Rating 75 1400 metres. She was a course/distance winner on Dead6 in January, following a second here on Dead4 at her previous start, and reasonable heavy track times on the day could help her. Fixed odds: $12.00 & $3.80.